Search Results for "blackjack twenty one"
Revealing a blackjack hand of 21 with Ace and King spades. Player holding cards with twenty one. 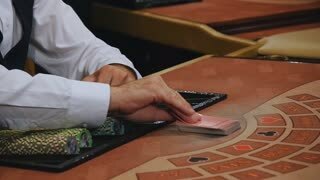 Green casino table and betting chips on background. The video shows how four piles of coins are formed. The passage of time and the arrival of one coin at a time to form ever higher piles, up to the last coin that runs away. 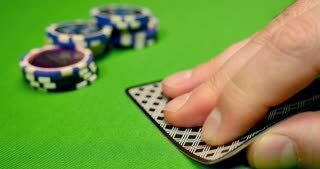 Man's hands open royal flush of hearts one by one and throw them on heap of chips, blurred background, winning in poker, gamble. Close up, shallow DOF, slow motion. One hundred dollar bills, deck of poker cards, red, green, blue and black casino chips and two red dice rotating on green table, poker game, gambling. Close up, seamless loop, 4K Ultra HD. 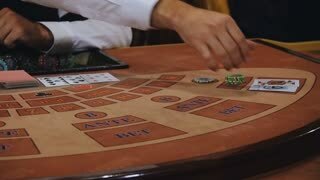 Piles of green, red, blue and black casino chips are on green table, male hand adds one more set of blue tokens, stake, victory, success in gambling. Close up, 4K Ultra HD.